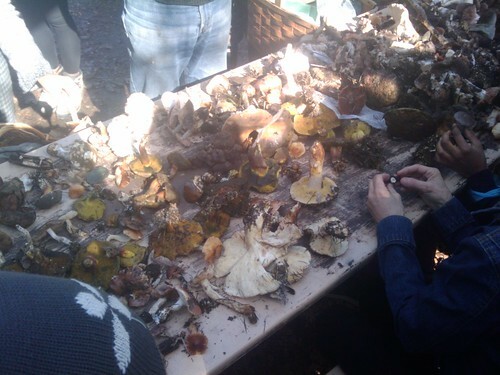 This last week, Machine Project has been hosting several different events as part of their FungiFest 2010. Chris and I decided to check out their mushroom walk this morning at Franklin Canyon Park. I was a bit skeptical when we showed up and they turned us loose into the woods to gather whatever we found with only a few words, but the whole experience was quite interesting. I guess most of my enjoyment was from bringing in one of the largest specimens. After everyone returned from hunting, Dr. Bob Cummings identified the many different kinds of fungus we had found. While Chris and I only come across four, the group effort came up with at least fifty different kinds. The one pictured above is Suillus luteus or Slippery Jack, named for its slimy top. 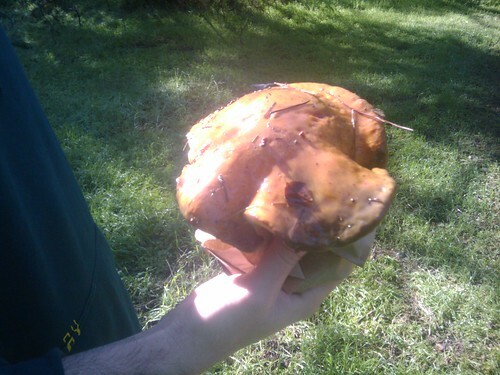 It’s found on pine roots and is edible if the brown slimy skin is removed. There was an equally large cap from the deadly Amanita ocreata destroying angel. The majority of edible mushrooms we found were Boletus edulis, porcini, which you can buy immature in some grocery stores. Two of the more interesting edibles we found: Coprinus comatus, shaggy mane, must be processed within 4-6 hours of picking because the cap will quickly digest itself into a black spore filled ink. Clitocybe nuda, wood blewit, is also edible and has a lovely purple-pink color. It was a great day and you can see a video of Dr. Cummings showing many of the same mushrooms we saw today embedded below. Mushroom Walk? there is a joke in there somewhere, but I am just glad you are posting regularly again!